A gentle family dentist, Drs. Kathie, Edwards, and Walsh enjoy treating children. Dr. Kathie has had a wide array of experience with all age ranges and abilities of children. In the military she was in charge of the preventive dentistry program for 2500 children of the Fort Lewis military community. Early, positive dental experiences can promote a lifetime of good dental habits. 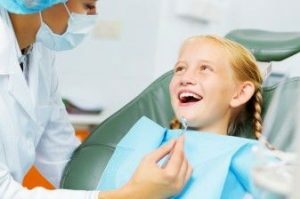 Fluoride and Sealants – To support development of good oral hygiene in children, we offer safe and effective dental sealants and fluoride treatments. A dental sealant coats the surfaces of teeth with a protective barrier to keep out bacteria and elements that promote tooth decay. We apply fluoride using a variety of flavors to make the experience fun and interesting for kids. Simple fluoride treatments also improve your children’s chances of warding off decay in young, vulnerable teeth. Here in Mason County there is not available fluoride in the public water systems. Most pediatricians and dentists recommend supplements of fluoride for children in their growing years. Learn more about fluoride. Learn more about sealants. Sportsguards – Sports are great exercise and great fun, but they can put your smile at risk. Get in the smile protection game with protective sports mouthguards! Dr. Ketcher can create a custom-fitted mouthguard that will fit comfortably. While similar products are available at sporting goods stores, only a professional can give you the custom fit you’ll surely prefer. Ask us about our agreement with the Shelton School System to provide free mouthguards for athletic teams. Learn more about mouthguards in our library. Bring your child in for a visit. The American Dental Association recommends a child’s first dental visit to be at the age of one. We would like to see your child before you notice problems. During your child’s first exam, we call it a ‘happy visit’, we will let your child orientate to the office. We will have a show and tell session to allow some trust and comfort. We will gently check for proper tooth development, bite alignment, look for decay and recommend therapies to combat it. We will focus on parent and child education. In continued appointments or as the child allows we will introduce more advanced care such as radiographs, polishing, and cleanings.